Gift 1888 from the artist to John Peter Russell [1858-1931], Belle-Isle-en-Mer; (sale, Paris, Hôtel Drouot, 31 March 1920, no. 63); (Le Garrec Art Gallery, Paris); (d'Audretsch Art Gallery, The Hague); (Lutz Art Gallery, Berlin); Georg S. Hirschland [1885 -1942], Essen and later New York; by descent to his nephew Richard S. Hirschland [1913-1960], Englewood, NJ; (Hector Brame, Paris), 1965; Mr. and Mrs. Paul Mellon, Upperville, VA, 1965; gift to NGA, 1992. 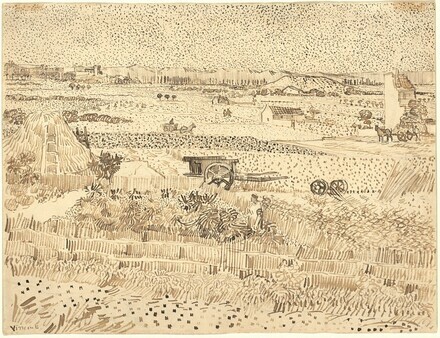 Cleveland Museum of Art, Works by Vincent Van Gogh, 1948. French Paintings from the Collections of Mr. and Mrs. Paul Mellon and Mrs. Mellon Bruce, National Gallery of Art, Washington, 1966, no. 239, repro. NGA Master Drawings 1978, p. 104. NGA Anniversary 1991, pp. 232-233. Van Gogh at Work, Van Gogh Museum, Amsterdam, 2013, fig. 237 (unnumbered catalog). Roskill, Mark. "Van Gogh's 'Blue Cart' and His Creative Process." Oud Holland 81, no. 1 (1966): 3-8, 13 (illustrated p. 11, fig. 4). Jan Hulsker, The Complete Van Gogh--Paintings, Drawings, Sketches, New York, 1980, pp. 344, 346, 350, no. 1527. Walker, John. National Gallery of Art, Washington. Rev. ed. New York, 1984: 683, no. 1097, color repro. Sotheby's, London, 24 June 1997, under lot 7, fig. 3 (caption is switched with fig. 4). "Impressionist and Modern Art, Part One," Sotheby's, New York, 5 November 2003, 28, 30, fig. 30 (under lot 6).